At 1945hrs on Saturday 3rd February 1940, a pair of local teams faced-off for the first time at the Belfast Ice Rink Ltd. The rink at King's Hall, Belfast, Co. Antrim drew a large crowd to witness a new phenomenon to the people of Northern Ireland. Tickets sold for 2/- reserved or 1/6 at the door and Sir John Gaston’s Belfast Ice Rink Ltd. were the home team’s sponsor. The visitors’ sponsor was the Short and Harland Aircraft Factory. They extended an open invite to the public to come and skate after the came provided they brought their own skates. The thrilling game ended in a 7-5 win as the home team Balmoral Tigers claimed victory over the Short and Harland Raiders. Live commentary throughout the game helped a novice crowd keep up with the action on the ice. The speed of the game and the clever tactics of the players produced lightning movements that time and again raised rounds of applause from the packed tiers. Newspaper Report from 5th February 1940. At the end of the first period, Balmoral Tigers led 3-1 with goals from Dickson, Ayres, and Norwood. Raiders responded once through Baillie. Another Norwood goal and one from Cooley made it 5-1 at the end of period two. Up against it, the Raiders changed up their forward line and an inspired Magwood netted a hat-trick with 3 goals in as many minutes. Irish-Canadian Archie Greer responded with a brace leaving the score at 7-4 at the end of the second. In a slower-paced final period, only a single goal from Baillie for the Raiders reduced the deficit to 7-5. 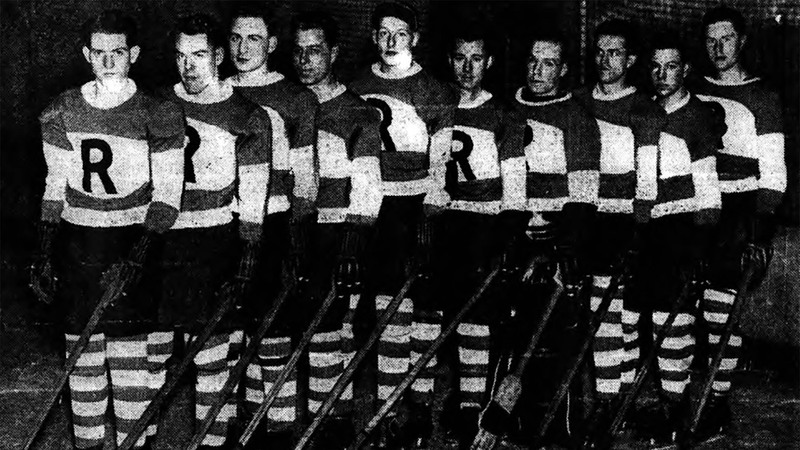 Newspaper archive photo: The Short and Harland Raiders line up to face the Balmoral Tigers in King's Hall, Belfast on 3rd February 1940. Copyright The Belfast Newsletter. As well as the thrills and spills of the game, Miss Dorothy Reid performed an exhibition during the break between the opening periods. The 15 year old from Westland Road, Belfast, Co. Antrim was the current Irish Champion skater and the first amateur to perform an exhibition in the King’s Hall. Dorothy was a product of tuition at the Belfast Ice Rink as well as the Royal Academy of London where she studied ballet. The experienced Belfast schoolgirl performed with strained ligaments. She was an experienced dancer who performed twice weekly for the troops based in Belfast. Another impressive performance from a local youngster came from 14 year old Dom McIntyre, a forward for the Balmoral Tigers. He only strapped on a pair of skates for the first time when the rink opened but was already showing promise as an ice hockey player, making up for a lack of stature with an abundance of skill. Newspaper archive photo: The Balmoral Tigers line up to face the Short and Harland Raiders in King's Hall, Belfast on 3rd February 1940. Copyright The Belfast Newsletter. Johnson, McLaughlin, Greer, Ayres, Monovitch, Dickson, Norwood, Cooley, McClelland. George, Johnson, Baillie, Green, Magwood, Blake, Dunbar, Brooks, Baillie. Arnold Brockman, Sergeant Rothwell, W Mackay, Sidney Lee. 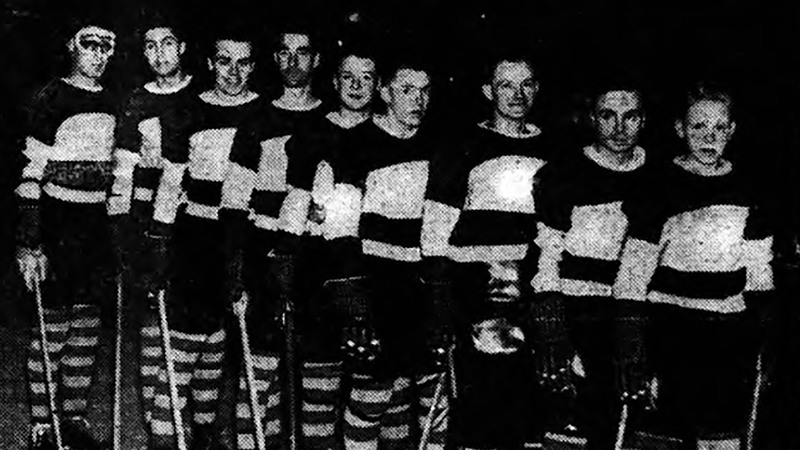 At 1945hrs on Saturday 2nd March 1940, Balmoral Tigers and Short and Harland Raiders faced off at the Belfast Ice Rink Ltd. at the King's Hall in the first Northern Ireland Ice Hockey League match. The venue, sponsors, and ticket prices remained the same as the opening fixture in February 1940. The game ended in a 5-2 win for Balmoral Tigers, with star player Archie Greer claiming a 2nd-period hat-trick. At the end of the first period, Balmoral Tigers and Short and Harland Raiders tied at 1-1. Tigers’ G Dickson cancelled out the 1st-minute goal from C Dunbar of the Raiders. Most of the goals for Balmoral Tigers came in the 2nd-period. A Greer and Donovitch opened the scoring in the middle period before Greer claimed 2 more to earn the hat-trick. Raiders responded in the 1st-minute of the 3rd-period with an unassisted goal from C Steel, direct from the face-off. Johnson, Davidson, McLaughlin, Ayres, Cooley, Dickson, Norwood, Monovitch, Greer, McIntyre. George, Steel, Finlay, Brooks, Robb, Montgomery, Dunbar, Baillie, Baptie, Magwood, Blackstock. If you enjoyed this post on "Balmoral Tigers v Short and Harland Raiders at King’s Hall, Belfast, Co. Antrim", please share with your friends and followers.